So, in January I wrote about my goals for 2012. How did I do? I built saw benches with the boys. I helped Mark, Nick and Ben build drunken cutting boards, though never finished my boards (goal for 2013). Built a “magic treehouse” style ladder with the boys. I made cutting boards with the boys (and for our kitchen). I built Jenga blocks and boxes. I built a coin-holder for a friend at work. I built shelves for the kitchen (where the stock cabinets wouldn’t fit). I reorganized and built new stairs to the second floor of the workshop. Susanna and I changed the layout of the kitchen and added a laundry room (the laundry room and mud room still need to be renovated, but that wasn’t on the list for this year). Susanna and I installed new cabinets in the kitchen. Painted part of the house (though that was mostly Susanna, Sofia, Rebecka and Linda). Installed trim around the garage door. Grew a garden (though not a very good one). I moved the sailboat out of the garage, but didn’t get it in the water. I had a pretty busy personal life. Susanna and I got engaged. We had Susanna’s sisters (and Linda) visit us for a month this summer. We did visit Six Flags a bunch of times. The boys and I drove to Pennsylvania for a family vacation with my dad and brother. But, we didn’t get out camping at all this year (I want to change that next year). Another goal was to ride my bike into work more often. I probably rode more often than the year before, but not enough. I said that I wanted to do lots of walks with Susanna and the dogs, which we did. I said I wanted to be better at finishing projects. I have been better at not starting project until I finish old projects. I think that was my big goal for the year (to not have as many unfinished projects hanging out). One of the characteristics of ADHD is that it fun and exciting (and easy to concentrate on) when starting a new project. However, new things get old, and it is difficult to find the energy to focus on and complete longer projects. Ben’s room was the perfect example. It took lots of assistance from my dad and Susanna (and several years) to finish. As I write this, I feel that I only have a few unfinished projects hanging over my head. I have an uncompleted kitchen island in the workshop – I suspect I won’t be finished with the island by Tuesday. I have small repair projects to complete around the house, but nothing major – they may be finished by the end of the year. The workshop needs work, but I suspect that will be an ongoing project. The kitchen needs a little touch-up paint, but Susanna is working on that, so it isn’t in my list of things to finish. I plan on keeping focus on finishing things for the upcoming year, it is nice to look back on the things that one has finished. Also, this is my 200th post in this blog – a nice milestone to reach. Merry Christmas! Our family had a great Christmas day. Susanna and I went to Christmas Eve services last night (yes, I don’t know what is wrong with me… but it was nice to get out of the house). The boys arrived this morning and will be here until Sunday. The plan was to let them get settled from transition and then open gifts. The boys decided 15 seconds after arriving that they had settled long enough to open gifts. We all enjoyed a relaxed Christmas day. Susanna started reading “50 Shades of Grey.” I helped the boys with their Christmas projects. 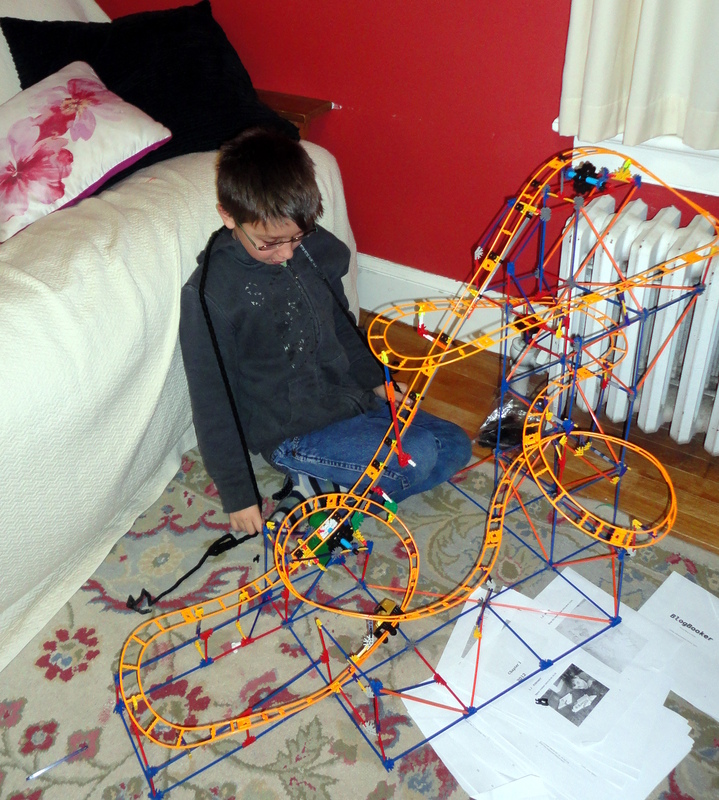 Ben spent most of the day assembling a complicated toy roller-coaster. He doesn’t actually need much help (only a little help at the end getting things running smoothly – it won’t be much longer before he gets to the point where I won’t be of any help). 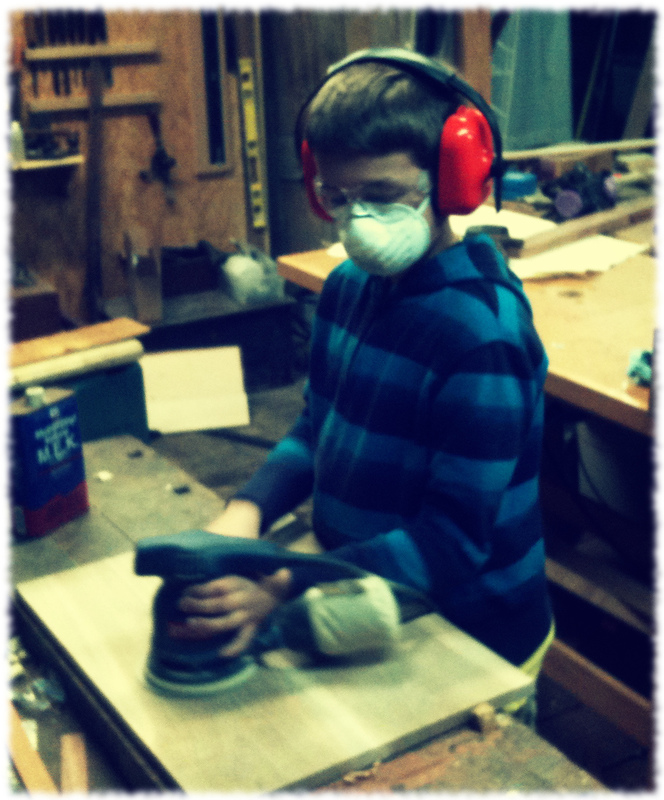 Will had a lesson on carving wood at the Mystic Seaport in on a field-trip with his school earlier this year. 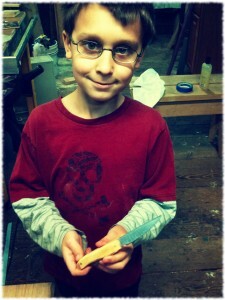 He had enjoyed carving, and had asked for carving chisels for Christmas. Today, I helped him get set up in the workshop, and I milled him some lumber to carve with his new chisels. I think he likes carving because it is something he can show the rest of us how to do. I first traced some letter so he could carve his name. 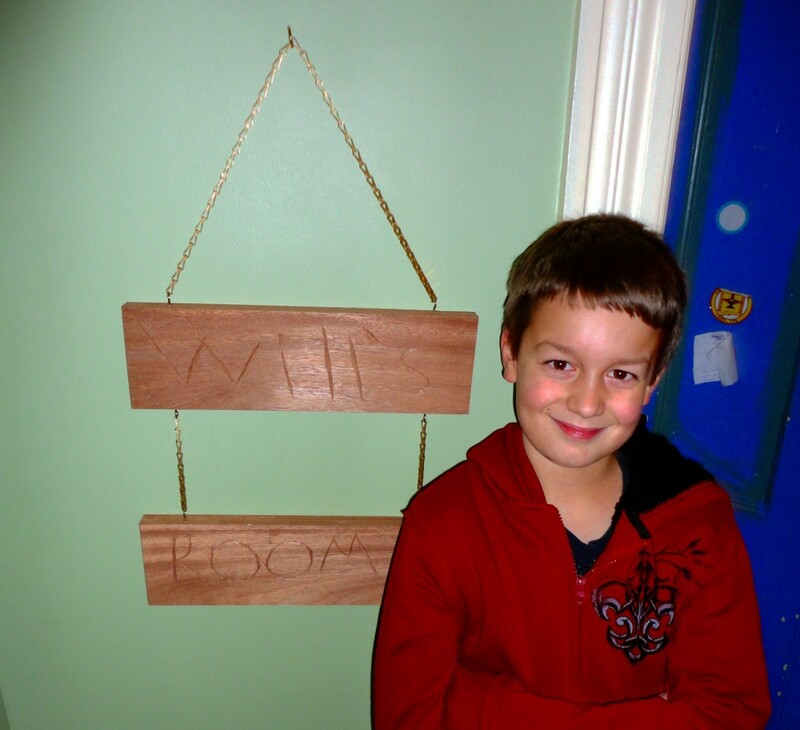 Then we milled a piece of sapele (actually two) and he carved a sign for his room. We hung it on some sash chain and brass hooks outside of his door. Maybe tomorrow he will make a sign for his brother’s room. Will showing off his new sign forhis room. Countertop installed next to the stove. 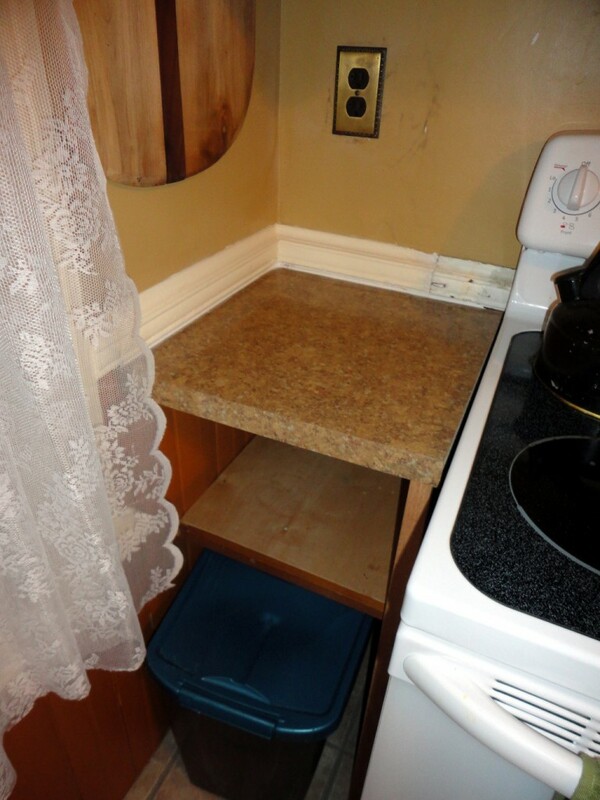 The space between the stove and the wall couldn't fit a stock cabinet and top. As if both readers of this blog aren’t getting sick of reading about kitchen improvements. Writing about the progress in the kitchen is a good excuse for not making more progress on the kitchen. Okay, maybe not. But I’m using it. I didn’t get started on house projects until mid-afternoon. Susanna went for a long walk with our neighbor, so I had a couple of hours (after our walk with the dogs) to work in the kitchen. I cut a countertop for the corner out of the remnants from the main counter (specifically, the cutout from the sink was big enough to use). 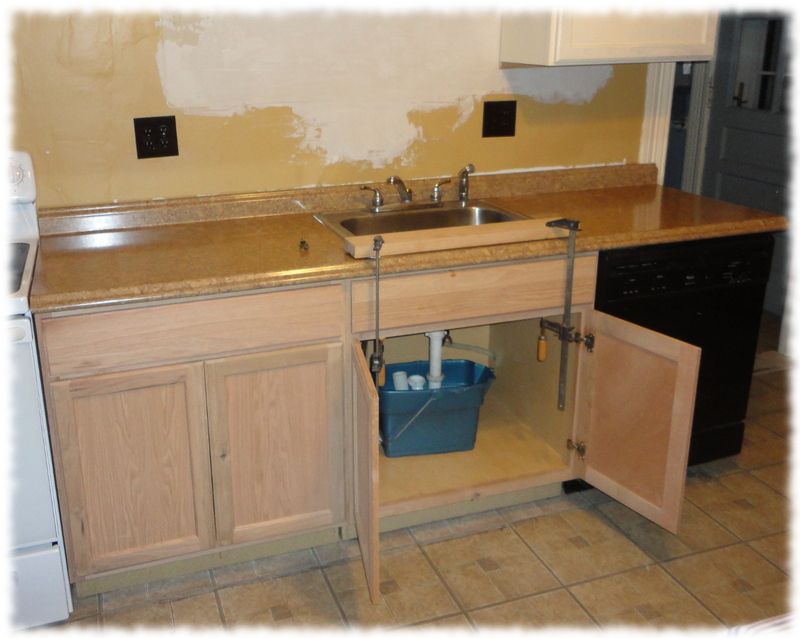 I had purchased a kit from the store to laminate the end of the main countertop, and the kit included two pieces of laminate, so I quickly trimmed the extra piece and ironed it onto the front of the countertop. It took maybe 15-20 minutes to file the laminate flush with the existing surface, and a few minutes to replace the temporary piece of wood with the finished top. I caulked the top edge of all the counters as well as the bottom edge of the upper cabinets. I milled a piece of sapele for the toe kick. I know, it feels almost wrong to use a piece of exoctic lumber for a toe kick that will get painted – but it was in the lumber pile, so costs less than picking up a piece of wood at the store. And it was almost the right size, so it was a lot less work than milling down a large piece of oak or cherry. 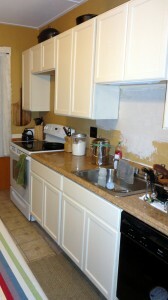 Tomorrow we will paint the wall over the counter, and I will install the laminate on the end of the countertop. If I have time I will run wiring to the light above the sink, and maybe replace some of the damaged floor tiles (linoleum not ceramic tile). It is that time of year again. Time to look back on the year. Time to get the blog printed into a book. Not only do I need to get this blog printed, I promised the boys that I will print their blogs as well. Last year I used blog2print.com. The site make it easy to print a hardback book from a blog, and the quality of the printed book is good. One of the things I didn’t like with the service was there was no control over the size of the pictures in the book. The quality of the images was decent, but they were all a little smaller than I would have liked. The book also doesn’t include comments. The comments aren’t really an issue for my blog, but for Will’s and Ben’s blogs, the comments would be nice. I’m trying a new path for the boys. I haven’t decided what do do with this blog. 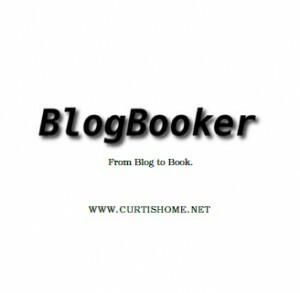 I am using BlogBooker.com. The service is free (though to get it to use high-resolution photos you must make a donation (about $14). The service takes the blog and converts it to a print quality PDF. I can then upload the PDF to Lulu.com. With BlogBooker.com and Lulu.com, I can only (easily) get the book in a 6×9 or A4 (letter) softcover book. I probably could find a way to get it to one of the hardbound book sizes for Lulu.com, but it would require a couple of extra steps. Another advantage is that I could open up the Lulu.com books if grandparents wanted to get a copy of the boys’ blogs. BlogBooker.com also allows comments to be automatically included. If anyone has a better way to take a blog and publish it, please let me know. New microwave installed - the kitchen is starting to feel finished. Today was a day to work on some of the remaining small projects in the kitchen. The cabinets are in, so all that remains are the odds and ends to finish up. If one ever totally finished any room in an old house. First, I did some more patching of the wall over the sink. I think one more coat tomorrow and we can paint. Next I replaced one of the broken linoleum tiles in front of the dishwasher, and reinstalled the trim underneath the dishwasher. After lunch the new microwave arrived, so this afternoon I installed the microwave. 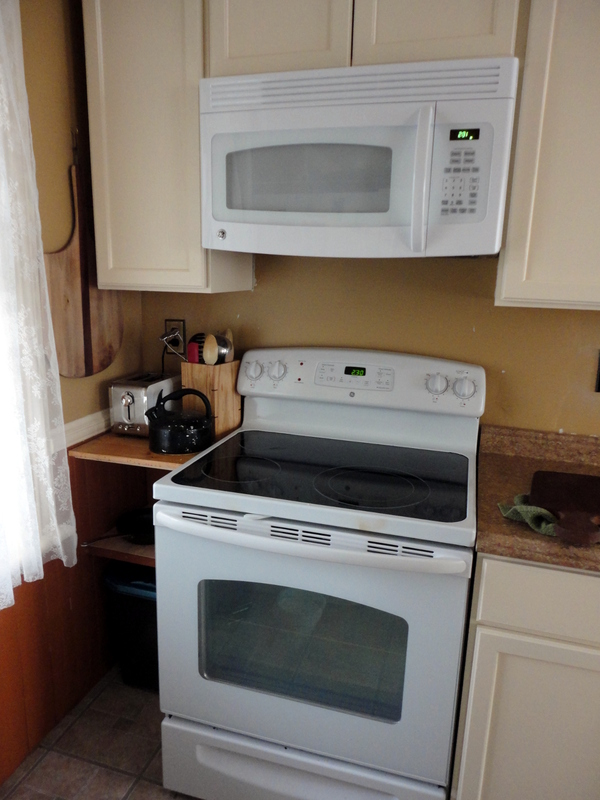 The power was already run to the back of the cabinet above the stove, so the installation was quick and simple. 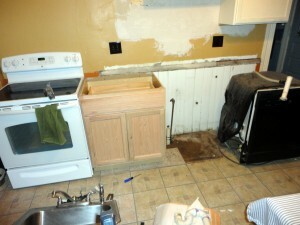 There are still probably one or two days of small projects to finish up before finally finishing the kitchen (for now). But those are for another day. Tonight, Susanna and I are heading out to a friend’s house for dinner. I’ve had a couple of evenings and a full Sunday to work on small projects in the workshop. Some of the projects are my (continual) reorganization of the workshop, and cleaning up from house projects. But I was able to get some work done. The boys and I worked on their Christmas projects. We almost ran out of time to finish them – it has been a busy month and they are missing two weekends in a row here. We get lots of time after Christmas, but that doesn’t help with the Christmas projects. My friend, Mark, has been over and we have been working on his drunken cutting boards. We should be able to finish his boards tomorrow – then it is time for me to make my boards. They will have to be “after Christmas” presents. Last weekend I built two sets of Jenga blocks and boxes. One was made from sapele (or mahogany) and the other from cedar. The sapele on is pretty heavy – we have to play it on the floor or risk hurting people when it collapses. Will working on one of his (and Ben's) Christmas projects. No one likes to sand, but it is a needed evil. I’ve been building a better (now my third try) clamp rack in the workshop. The last one wasn’t bad, but took a lot of wall space. I’ve also been trying to add some insulation – just enough that my kerosene heater will be able to warm up the space. It is starting to look like I’ll have the entire week off next week. Lots of time to finish the kitchen and get some workshop projects done. Susanna is still waiting on an island for the kitchen. One has to love fourth grade. Will announced today that he has a girlfriend. Okay, not quite announced. Maybe it was more like an admission. It has been a busy week. The boys weren’t with us last weekend, so we had some time to get chores done. The missing upper cabinet didn’t get in until Tuesday, so no kitchen progress. But I did get lots of time in the workshop on Sunday. I haven’t had a full day to work in the shop in a long time. It seems that most free days are filled with home improvement projects. It was nice to take a break from home projects. 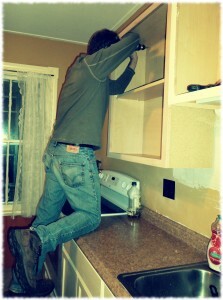 We picked up the new cabinet on Tuesday, and hung the cabinets that night. Susanna painted the cabinets and the doors this week, and tonight (after the boys went to bed) we reinstalled the doors. I still need to finish the wall under the cabinet, and caulk the joint between the counter and the wall, but the end is in sight. It is already a much more useful kitchen layout. Next, I’ll have to finish the island that I have in parts in the workshop. Maybe I can get that done in early January. I’ll post pictures from workshop projects next week. The boys and I worked on Christmas projects, so I don’t want to post pictures until after the holiday. 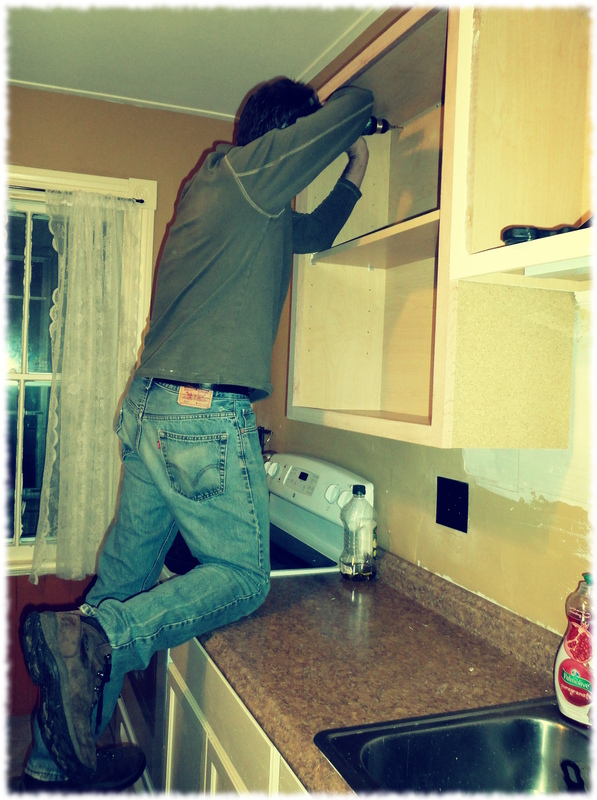 A nice view of me installing the upper cabinets. 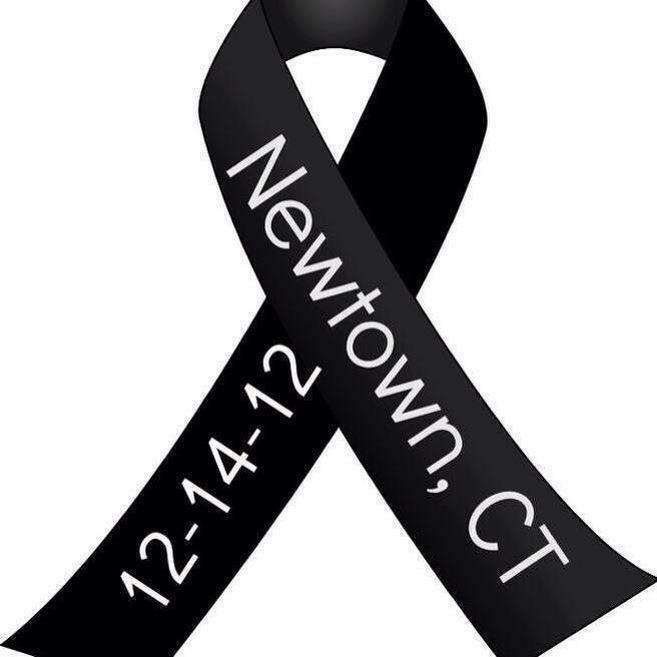 Let us mourn for the senseless tragedy at Sandy Hill Elementary School in Newtown. It is often far too easy to ignore violence when it takes place on the other side of the world, or even half-way across the country. It is much harder to ignore when it occurs close to home (on the other side of the state). Friday’s events were too close. From the initial panic when seeing a news flash of an elementary school in lockdown in Connecticut – knowing that both Will and Ben were in their elementary school at that time. To the relief on finding that it was on the other side of the state. Then the sadness as the news of the real horror of what happened started making it to us. As we collectively grieve the horror, we should not forget those who are grieving a personal loss today. I’m still waiting on the missing upper cabinet to arrive. This gives me time to work on the lower cabinets. I ripped out the existing cabinet. It is in pieces in the front yard (here’s to hoping that Susanna gets time to move the debris under the garage tomorrow). 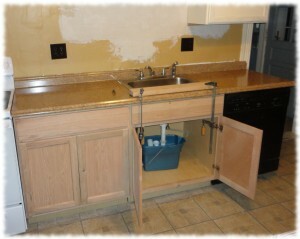 I was able to get the lower cabinets in and get the counter and sink installed. Our original plans were to take the evening off and watch a movie, but decided instead to see how far we could get on the kitchen instead. Tomorrow I’ll make a trip to the store to get the last piece of piping to finish the sink drain and we can get a working sink back. And (for those following the story), Tucker spent all day sleeping on the dog bed. He got up to go out twice and eat dinner. He is still sleeping. Serves him right for disappearing for 15 hours.